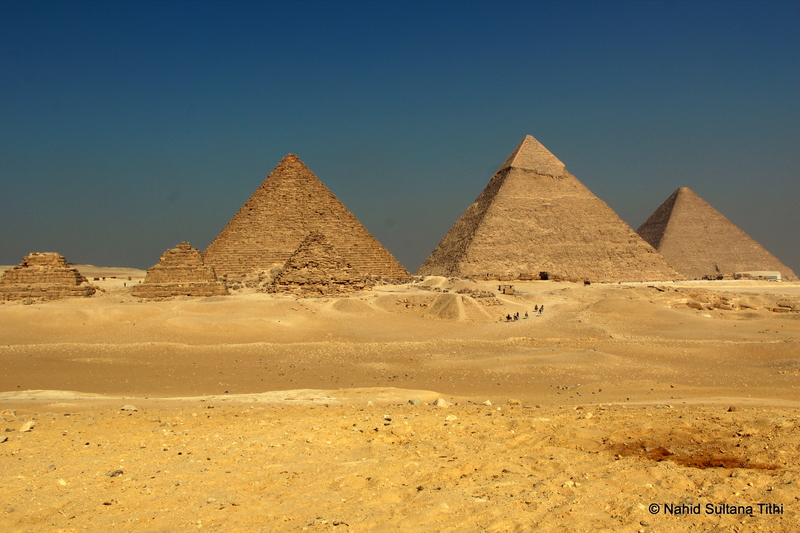 GIZA, MEMPHIS, & SAQQARA: Giza is THE site where most of the tourists (if not all) come to while visiting Cairo. This is the iconic image of Egypt and one of the most famous symbols of all ancient wonders. 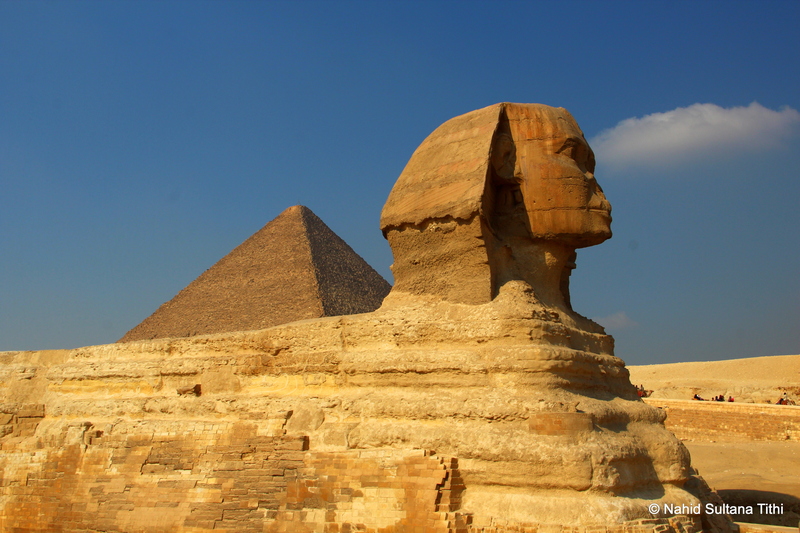 The pyramids and the sphinx in Giza, a UNESCO World Heritage Site, give a real glimpse to the early Egyptian civilization, their life-style, beliefs, and talents. Looking at something that old (from 2500 BC) literally gave me goose-bumps. Memphis is more like “an open air museum” as our tour guide Haisam said. This was the first capital of unified Egypt during the Old Kingdom around 3000 BC and another UNESCO World Heritage Site along with the pyramid complex in Giza. Saqqara is also a necropolis which houses the first and the oldest pyramid in Egypt. I think I would really remember the beauty of the desert of Saqqara for a long time. It was almost sunset; we were standing on a small hill and looking at other pyramids in far distance. The sight of sand with pyramids in the backdrop during that moment will stay with me as long as I live…this was a memorable day overall. Please scroll down to “Places We’ve Visited” for detailed information on these three places. TIME of TRAVEL: We flew to Cairo during our Christmas break of 2012. Although Giza is about 45 minutes of drive from Cairo downtown, it took us little more than an hour to reach there due to traffic conditions and some road blocks. November to March is the best time to explore Egypt, when the weather is fine and you can enjoy desert sun without going crazy from exhausting heat. OUR HOTEL: We stayed in Cairo Moon Hotel in the heart of Cairo, only 10 minutes’ of walk from Cairo Museum and Tahrir square. Honestly speaking this was a below average hotel with tiny (for only 3 people) and scary elevators, big red ants walking all over the floor, too much noise late at night, and few other problems. But the owner of this hotel, Mohamed, is an exceptionally friendly and helpful gentleman. All the staffs here are same way too which overcomes all the other problems of this hotel. Mohamed organized few trip for us here and there including the trip to Giza. We paid 45 USD for a private car with driver and 15 USD for a tour guide, Haisam (please click on my Tour Guide tab if you or someone you know needs a tour guide in Cairo). For a total 60 USD, I think, we got a great deal to tour around Giza, Memphis, and Saqqara. Fortunately, brother Haisam was an excellent guide who knew A LOT about Egypt from its ancient, recent-past, and modern era. He was very humble, gentle, nice, and finally, someone we could absolutely depend on for anything. EATING & SHOPPING: We stopped at a local street-side restaurant for lunch that day. It was more like a quick pick-up shwarma in between Giza and Memphis. There is absolutely no place to eat or have lunch within the boundaries of the pyramids; at least I didn’t see any. For souvenirs, we saw many individual vendors selling cheap items here and there in Giza and Saqqara. Memphis has more stores where you can get some small gifts and something for yourself. WARNING: do not buy any papyrus products from them as they are not real papyrus papers. Our guide Haisam took us to a big showroom of papyrus, Golden Eagle Papyrus on Sakkara Road. This is a government approved store, and therefore you know you are buying the real thing. It has hundreds of papyrus wall decors to choose from at various price ranges and with different themes. The guy who was showing us around actually took 10 minutes to show us how a piece of papyrus was made from its trees…thatwas absolutely fascinating and very educational for our little ones. Here is their phone number if you need it – +2037719585. 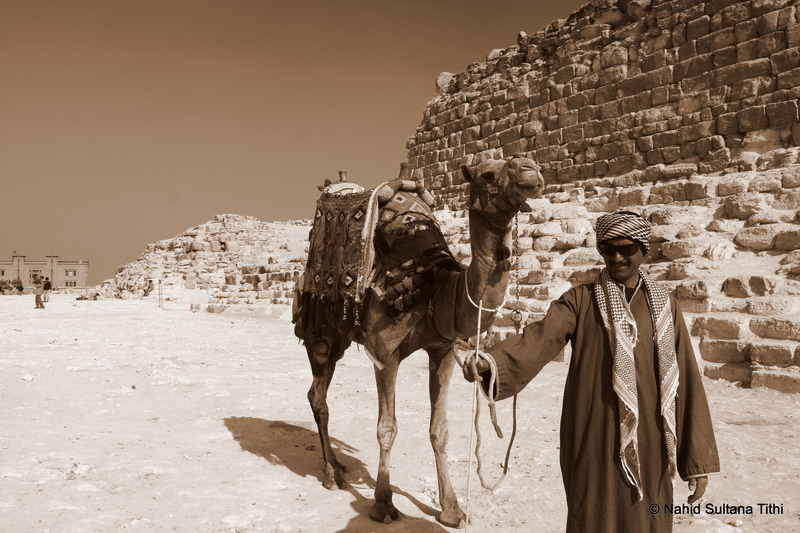 PLACES WE’VE VISITED: Our taxi left for Giza little before 9am and we reached the place where we were going to rent out camels from near the entrance to the pyramids around 10. Giza is the place where we spent most of the time – about 3:30 hours. Memphis is about half an hour drive from Giza and we spent, I think, about little more than an hour. Then our final destination of the day, Saqqara, was another half an hour drive and again, spent about an hour near the sunset time. Our guide, Haisam, kept us entertained with all the charming secrets of these pyramids and ancient Egyptians all day. 1) GREAT PYRAMIDS of GIZA & SPHINX: After arriving at Giza city, we first went to the place where we were going to rent our camels from; another option was to ride a horse (but who would…?). We took the longest ride which took us around the deserts, to the panoramic spot, to the pyramids, and then to the sphinx. Pardon my ignorance, but all this time I thought there were total of 3 pyramids in Giza necropolis. But as we were approaching the “Panoramic spot” near the pyramids, Haisam explained that there are 3 main pyramids which are the burial sites for 3 pharaohs (Khufu, Khafre, and Menkaure) and 6 small ones (3 with the pyramid of Khufu and the other 3 with the pyramid of Menkaure) for their mothers, daughters, and wives. Panoramic spot is an up-hill site from where you can see all the 9 pyramids lined up. 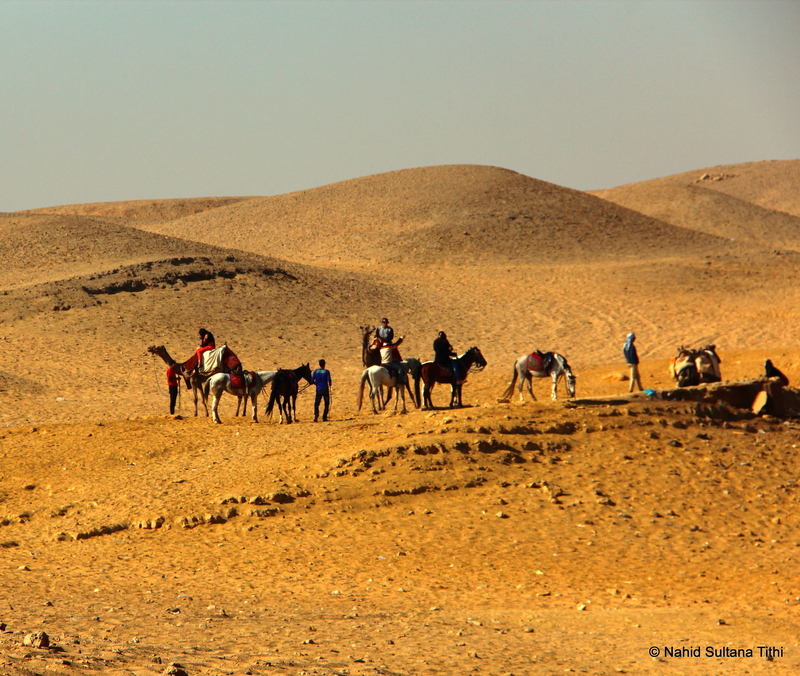 This place not only gave us magnificent view of the Great Pyramids, but from here we could also be fascinated by the wilderness of the desert. Watching men riding their horses fast, flying white sand in the air looked like Arabian Sultans chasing their enemies in Hollywood movies. I am not exaggerating, but it was a true beauty that I enjoyed from the back of my camel. After the panoramic site, we were on the camels again and off to get up-close and personal with these pyramids. So, we touched the old limestone of these relic structures, took some pictures, and back on the camel headed towards the sphinx. You can actually go inside the burial chamber of these pyramids which we didn’t do. At any given day, at least two of the three big pyramids will have the burial chamber open to visitors. And you pay separately for these visits. On the camel again and we headed towards the Sphinx. Sphinx of Giza, the biggest one in Egypt, is located in front of the middle pyramid, which was for Pharaoh Khafre. The Sphinx’s body is a combination of head of a man, representing the wisdom of human and the body of a lion, meaning the strength and power of a lion. This was our last stop before returning our camels to their owners and start driving towards Memphis. 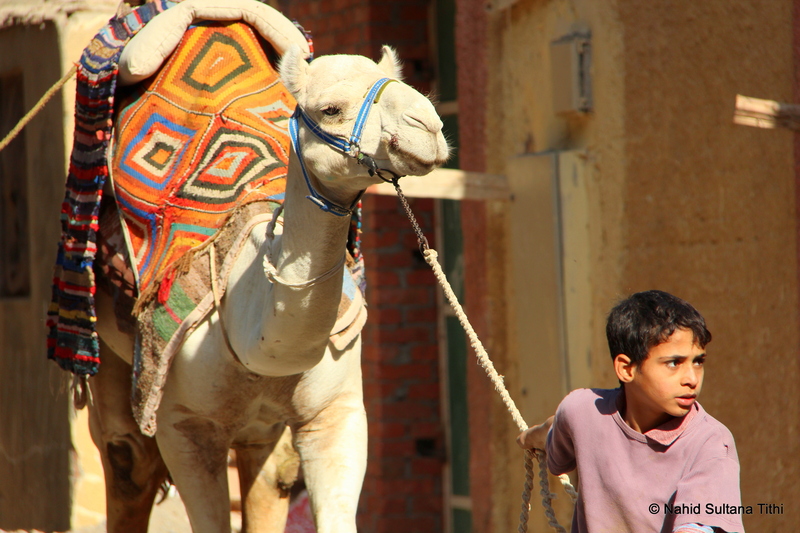 One thing I must say here is that, if you haven’t ridden a camel before, DO IT in Giza…you won’t regret it. I cannot describe the royal feeling of looking over the sand and to the astonishing pyramids from a camel-back as it slowly makes it trails into the heart of the desert…nothing beats that. It was a bit scary when the camel got up or sat down with me on its back…I felt like screaming every time. Oh, and not to mention the pain I had in my legs the next day from that ride. The trick of riding a camel is that you have to relax and just let your body move back and forth with the movement of the camel, which took some time for me to get used to. I felt like I was going to fall from that height and break a leg if I let my body loose. Here are some necessary information/precautions when visiting Giza. 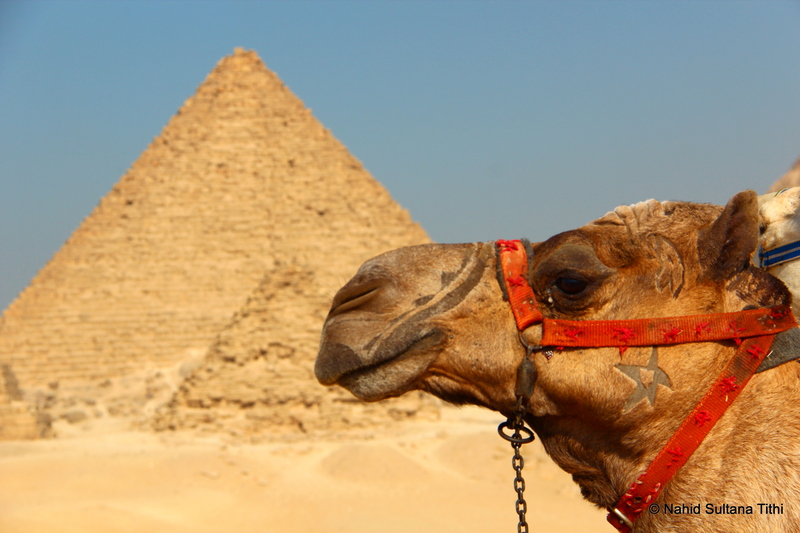 First of all, if you are thinking about riding camel/horse in the desert, see if your hotel/tour guide can arrange that for you before arriving in Giza. You can always contact and take our guide Haisam, if he is available (please click on my Tour Guides tab). Second, never, ever rent camels once you are already inside the perimeter of the pyramid complex. Lots of horrible stories have happened where they not only charge you sky amount of money, but also takes your money first for 1 hour and won’t give you the camel for more than 10 minutes. We paid 400 LE for 2 camels with 2 helpers for about 2 and half hours and a free horse for brother Haisam, our guide. Also keep in mind that, the helpers expect some tips after you are done with the trip…they work really hard walking on foot on the desert for a long time under the sun, be a little generous. The entrance fee to enter the main gate to Giza pyramids is 60 LE for adults and 30 LE for kids. If you want to go inside one of the 3 pyramids its 100 LE for adults and 60 LE for kids. Usually the biggest pyramid, “Pyramid of Khufu” is open every day for the visitors in addition to another smaller one. Another thing is – don’t wear any fancy clothes on the day you are going to Giza. You are going to desert, you will be covered in dusts by the time you are done seeing these pyramids and other sites. Wear something very comfortable, a hat, and take few water-bottles with you, especially if you are traveling in summer. Finally, don’t try to climb the pyramids…its forbidden and extremely dangerous. 2) MEMPHIS OPEN-AIR MUSEUM: This is rather a small open area to explore compared to Giza’s vast desert and the pyramids. There is an enclosed area where an enormous limestone statue of Egypt’s most important king Pharaoh Ramsey II from New Kingdom rests. Research has indicated that most likely it was Pharaoh King Remses II who chased Moses out of Egypt and drowned in Red Sea. 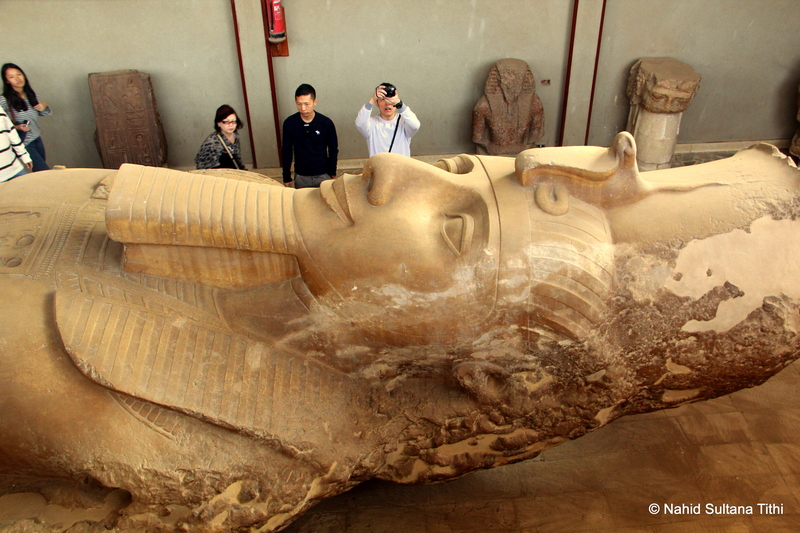 The statue is about 10 meters long and laying on its back. 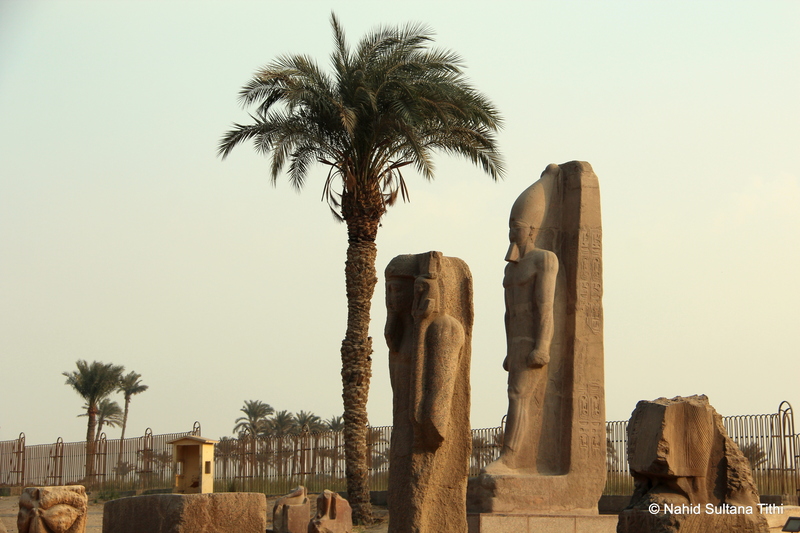 Outside, there are many ruins along with couple other smaller sculptures of Pharaoh Ramsey II. 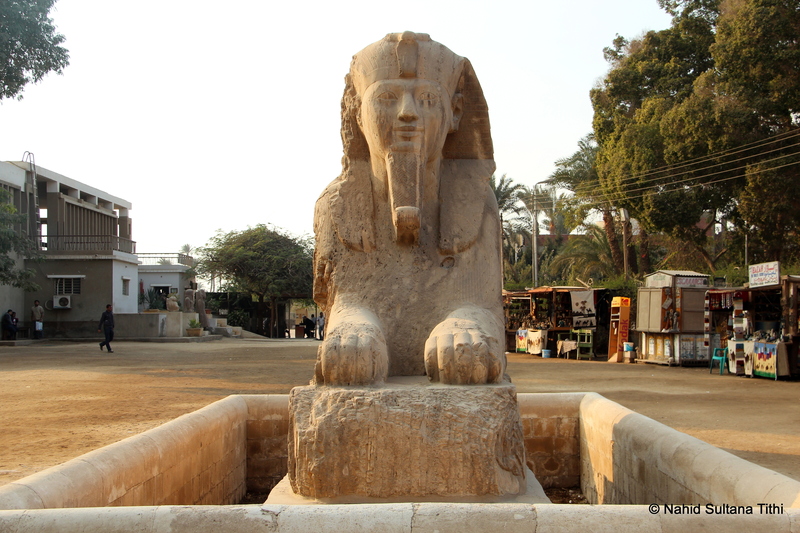 The alabaster sphinx, called Sphinx of Memphis, in the middle of the yard is in its original spot from 1200 BC. Entry fee here is 30 LE for adults and 20 LE for children. There are few souvenir shops lined up in one side of this open air museum. 3) SAQQARA NECROPOLIS: As I have mentioned above, Saqqara Necropolis is a vast burial ground which has the first and the oldest pyramid in Egypt. 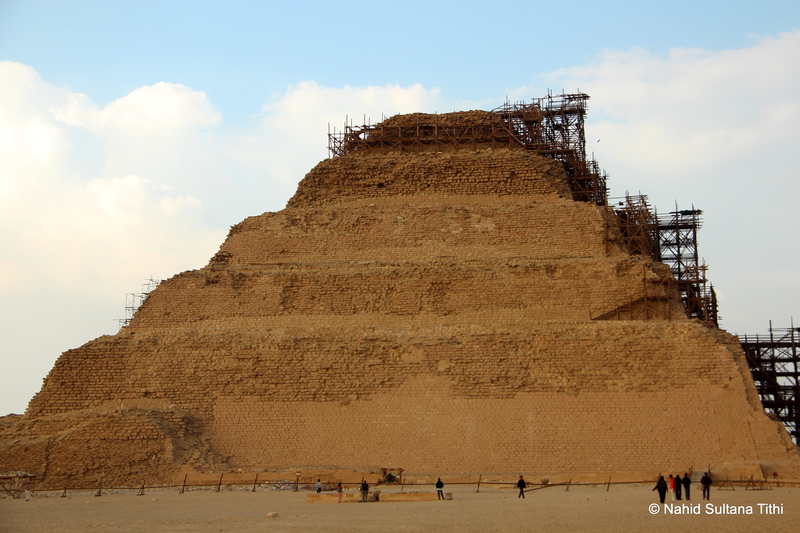 It features the famous Step pyramid of King Zoser or Djoser from the 27th century BC. 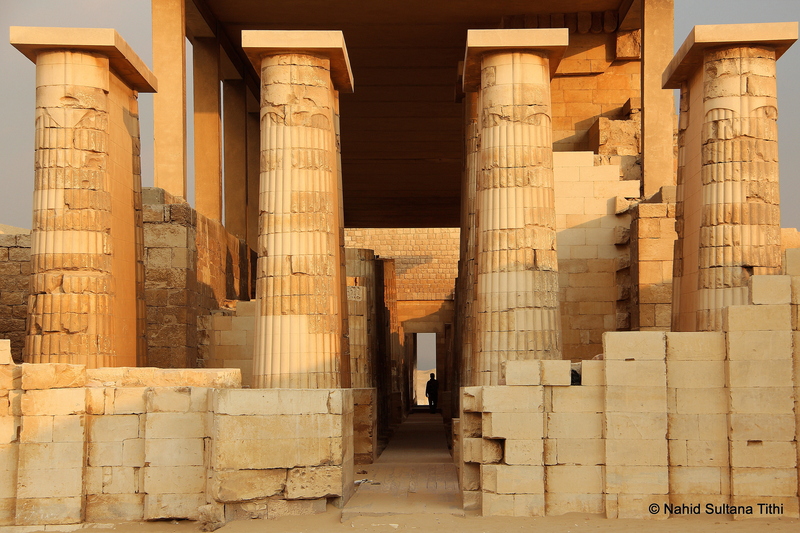 There is a corridor that you have to pass to come to the Step pyramid complex. I can’t remember what Haisam said, but the passageway is also an ancient stable-like architecture with many stone pillars and many rooms. After climbing the stairs opposite of the pyramid, we came up to a small hill, from where we saw another two famous pyramids in the far distance of Dahshur, called Bent pyramid and Red pyramid. Bent pyramid was built under Old Kingdom from around 2600 BC by the son of Djoser. This is an example of a transitional form of pyramid between Step pyramid and regular smooth pyramids. As the Bent pyramid did not come out the way expected it was never used. Instead the Red pyramid was built next to it with correct pyramidal angles and that is the burial site of the king. 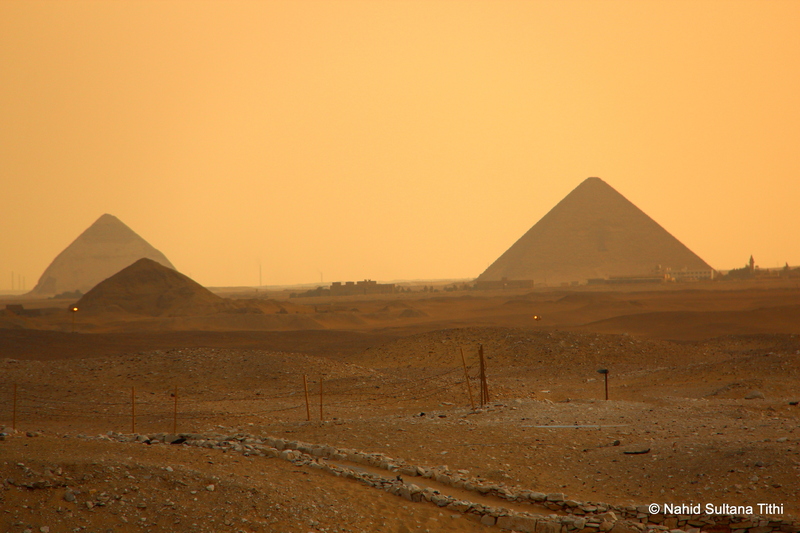 It was almost dusk and looking at those pyramids from afar on the dusty desert was magical. Entrance fee to Saqqara pyramid is 60 LE for adult and 30 LE for children. This is also a UNESCO World Heritage Site along with the pyramids in Dahshur.